Shares of the dairy company rose last month on a better-than-expected earnings report. As the chart below shows, the gains came entirely from a post-earnings surge toward the beginning of the month. Dean Foods, the nation's largest producer and distributor of fluid milk, said net sales fell nearly 1% to $1.98 billion as U.S. milk consumption continues its secular decline, with Americans switching to plant-based products like almond and soy milk. However, that result still topped estimates at $1.85 billion. The company said volume and sales mix were in line with its expectations, and general and administrative expenses fell by nearly a quarter to $75.5 billion as part of the company's cost-cutting plan, which it implemented following a dismal 2017. On the bottom line, adjusted earnings per share increased by a penny to $0.14, which was well ahead of the analyst consensus at $0.04. CEO Ralph Scozzafava called the company's execution solid, and said, "We took important initial steps to lower our cost base, and the traction that we're getting across our enterprisewide cost productivity plan is ramping up." He also reiterated the company's target of $150 million in annual costs savings by 2020. 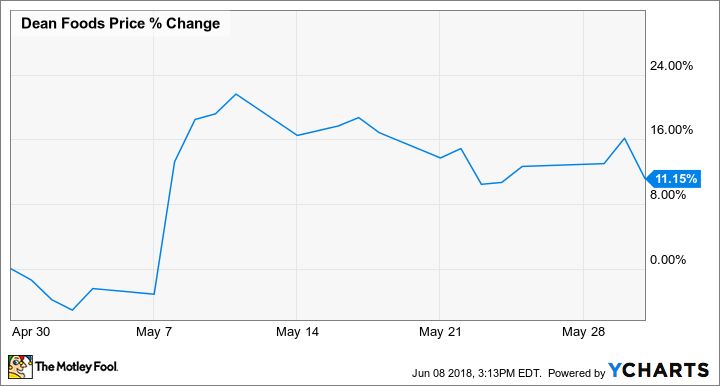 Dean Foods reiterated its full-year earnings guidance, calling for an adjusted per-share profit of $0.55 to $0.80 as the company continues to cut costs and right-size its network to match lower volume. During the call, the company also said it was considering increasing its investment in Good Karma Foods, which makes milk and yogurt based on flaxseed. That news may have also excited investors as alternative, plant-based milks have grown a lot faster than cow's milk in recent years. Dean is well familiar with that industry, as it formerly held a majority stake in Silk parent WhiteWave Foods before spinning it off in 2013. For now, Dean's cost-cutting strategy may hold some promise, but the secular decline in the milk industry should keep the stock's gains muted.